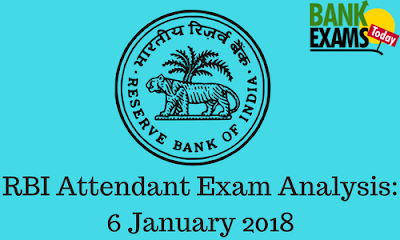 RBI Attendant which was held today is over and with the help of student’s review, we are here with the complete exam analysis. According to us, the ideal attempt for this exam would be 80-90. The overall exam was Easy - Moderate. This exam was basically cover four topics: General English, Reasoning, Numerical Ability & General Knowledge. Total 120 Questions (30 in each section) were given to be solved in 1.5 hours(90 mins). This section was Moderate. Reading Comprehension was moderate and Spelling Errors & Sentence Rearrangement were Easy. 2 puzzles and Seating Arrangement based on Circular (1 Variable), Floor Based (1 Variable) were asked. Only 1 type of DI (Tabular) was asked. As compared to the other sections, this section had some moderate questions. Some questions were asked from static awareness. Some of the questions were based on banking awareness and some were from current affairs.